On one lazy Sunday afternoon, Steve said, "Let's eat something nice but simple for dinner. How about steak?" O..K..I knew where this was heading. He will grill the steak and I will end up making minimum of two sides. Haha "simple" meal. It's OK. Because..I actually liked the idea! I didn't mind at all to make two sides as long as he brings me a piece of perfectly medium, nicely marbled, grass-fed rib eye. We like simple sides with steak. Our go to steak sides at home are sauted spinach and mac and cheese. 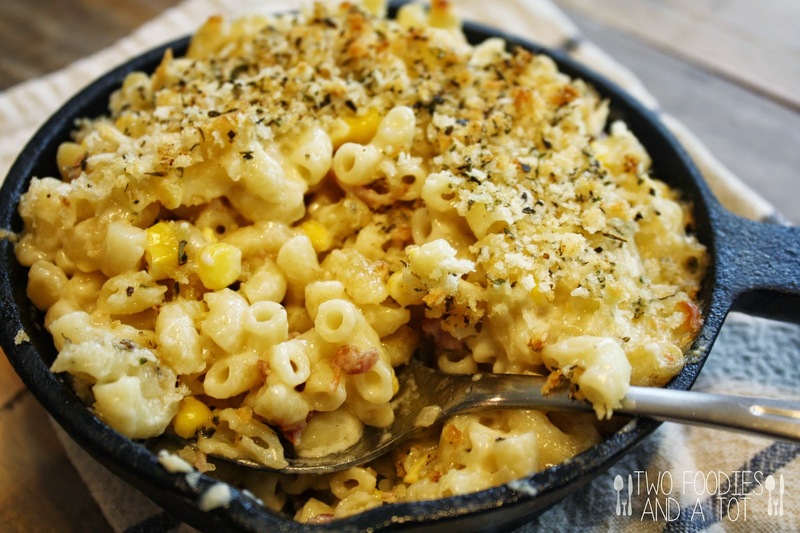 Knowing how much my hub loves his mac and cheese, I made extra portion, and we had last minute guests. Lucky I made extra, I didn't have to go crazy. Phew! This easy to make side is always a perfect fit for a great steak. 1. Cook the pasta as package directions. 2. Meanwhile, melt the butter in a large skillet and saute the shallot. Add flour to it, stir to make it smooth. Add milk, nutmeg, salt and pepper and let it simmer to thicken for about 2 minutes. 3. Turn the heat off and add cheeses, corn and bacon. Mix in the cooked pasta. Transfer it to an oven safe skillet. Preheat the oven to 375F. 4. 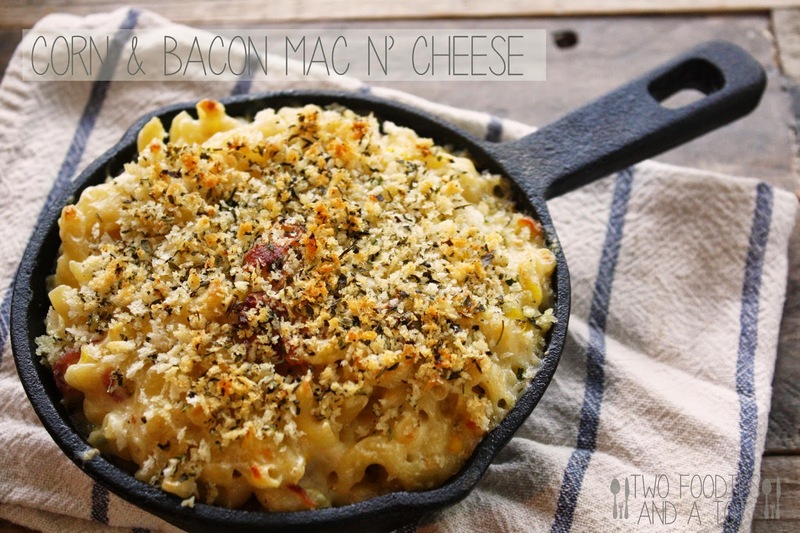 Make topping - Mix all the ingredients in a bowl and sprinkle on top of the mac and cheese. Bake at 375F for 20 minutes or top is golden brown. Serve immediately.